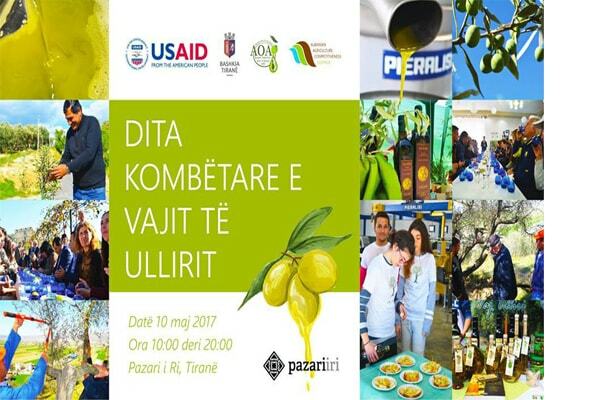 USAID, Municipality of Tirana, Albanian Olive Oil Association and AAC-Lushnja, will organize the National Day of Olive Oil, on May 10th, Wednesday, at New Bazaar (Pazari Ri), in Tirana. During this day a lot of activities will promote olive oil produced in Albania. There will be also a panel by Albanian tasting panel to check the quality of olive oil. The activity will start with the opening of the fair at 10:00. Different activities during the day will heat the atmosphere and at 19:15, the jury will announce the prize for competition XIII of the extra virgin olive oil.